Nan as Harry Dunne, Mark as Lloyd Christmas and our 4 year old daughter, as Mary Swanson. 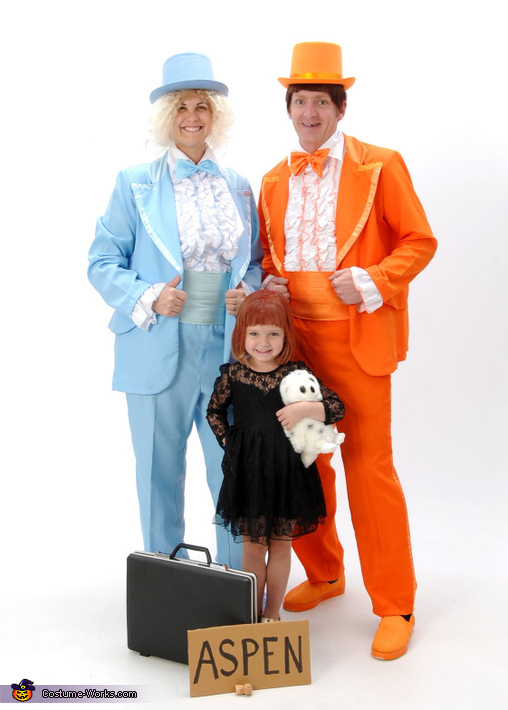 To prepare for the release of Dumb and Dumber 2 on 11/14/14, my family and I wanted to wear costumes from the original Dumb and Dumber film. The adult costumes and wigs are licensed Dumb and Dumber costumes that I purchased used from eBay. I ordered the felt hats, black tooth wax (for "Lloyd's" chipped tooth), and the snow owl from Amazon. I used and old briefcase we had at home. I sprayed my little girl's hair red with hairspray from Party City. My husband and I spray painted dowels for the canes and white shoes that I had gotten from Goodwill. We had a fun time with these costumes even though we had to fib to my little girl and tell her she was a flapper because she has no idea what Dumb and Dumber are...except the definition of her parents. Hope you enjoy our pictures.